One of my favorite fall fruits is apples! Recently, I got a bag of green apples from my Bountiful Baskets coop basket and I needed to use them up. 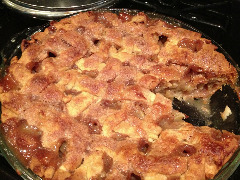 So, I decided to make homemade apple pie using a favorite recipe of mine. It was so yummy that I had to have a slice before I even got a picture!